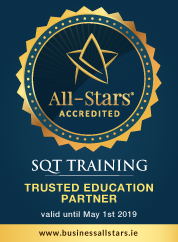 At SQT Quality Assurance is embedded in all aspects of the organisation. QA therefore spans both corporate (human resources, finance, health and safety etc.) and academic domains (teaching, assessment, curriculum, learning environment, student support services etc.). The Quality Assurance Handbook for QQI (HET) programmes is available here, whilst student handbooks for all NEBOSH and QQI learners are available for download here.